Rioting by a group of fishermen numbering over 500 temporarily disrupted the inauguration of a fisheries watch volunteer group at Otrokpeh, near Big Ada in the Ada East District in the Greater Accra Region last Friday. The volunteer group was being inaugurated by the Minister of Fisheries and Aquaculture Development (MoFAD), Mrs Elizabeth Afoley Quaye. The fisheries watch volunteer group is an initiative by the Fisheries Commission and its stakeholders. The groups are to monitor the beaches to enforce fishing regulations and infractions and assist in the prosecution of fisheries violations. They are also to patrol both sea and land to ensure that canoes that are being used are duly registered. At exactly 10 a.m., some fishermen from Ada and its environs started the protest, vowing to prevent the minister from swearing in the 50-member volunteer group selected from the Ada East District and the Accra Metropolitan Assembly. They destroyed canopies and plastic chairs at the venue for the event and verbally assaulted the minister and her entourage. It took the police more than an hour to bring the irate youth who had massed up at the scene, amid the chanting of war songs, under control. Mr Enoch Ayittey Tawiah, a former assembly member for Otrokpeh and fisherman, in an interview with the Daily Graphic, said the fishermen in the area were not consulted by the ministry before forming the volunteer group. He said the government should have involved them in the decision-making process before the formation of the group and its subsequent inauguration. The event eventually came off amid tight security. Inaugurating the volunteers, Mrs Afoley Quaye said part of the objectives of the government’s fisheries management plan was to strengthen participatory decision making in the sector. According to her, the low level of decline in fish production was as a result of the rampant use of unauthorised fishing gear such as monofilament nets and light fishing and the use of poisonous substances and explosives in fishing. The minister advised the volunteers to be firm in carrying out their mandate and also operate within the laws of the country to bring sanity into the fishing industry. She assured them of the backing of the ministry, the Ghana Navy, the Marine Police and the Judiciary in their operations. About 10 per cent of Ghana’s population depends directly or indirectly on the fisheries sector for their livelihood. The sector contributes 1.2 per cent of the country’s Gross Domestic Product. However, the fish stock is declining as a result of over-capacity, over-fishing and illegal fishing. 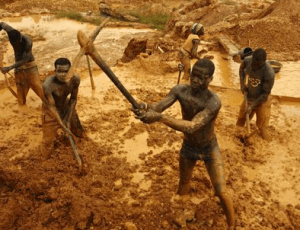 The Child Rights International (CRI), a non-governmental Organisation has called on the government to make its Social Protection (SP), interventions known in the handling and the stoppage of ‘galamsey’ activities in the country. 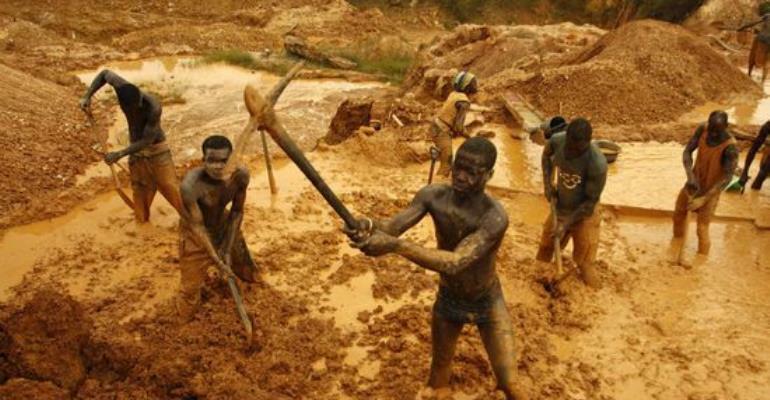 The Organisation, which based its call on facts gathered from a survey it conducted in eight districts to ascertain the prevalence of child labour in mining communities, said over 2,092 children were found to be at high risk of hazardous works, including ‘galamsey’ operations in these area. It said in the districts, which involved the Atwima Mponua, Atwima Nwabiagya, Bibiani, Asunafo South, Asutifi North and South, as well as the Ahafo Ano North and South, there were at least a family member in each of the sampled households who was engaged in illegal mining, and a total of 30 children identified to be working constantly in ‘galamsey’. Mr Bright Appiah, the Executive Director, Child Rights International, who made the call at a press conference in Accra Thursday, applauded government for the tremendous intervention in stopping the ‘galamsey’ menace, and pledged the total support of the CRI in fighting the course to the end. He, however, said in carrying out measures to halt ‘galamsey’ “we have to give attention to Social and Child Protection issues in the mining areas”, with the knowledge that children were also involved in the practice, which was a threat not only to their lives, but also to the country as it stood the risk of losing great leaders by record of a high school dropout rate. The country would soon face the consequences of witnessing increases in children’s vulnerability to diseases due to the pollution of the environment if the situation was not quickly addressed, he said. Mr Appiah said there was the need for government to look at the social protection implications on people, including children and put in place sustainable livelihood empowerment programmes as an alternative, to draw the affected into the social safety net. He suggested to the government to take the appropriate steps to investigate the condition of children and households in the ‘galamsey’ endemic communities in order to support their welfare, rehabilitation and re-integration into mainstream society. He said identifying such children would enable the government to withdraw them and develop remediation plans for their families. He asked that much engagement and collaboration with formal and informal community structures, including traditional systems, Child Protection Committees, School Management Committees, Social Welfare as well as the Domestic Violence and Victim Support Unit of the Ghana Police Service, and building their capacities to be pursued to achieve effective outcomes. 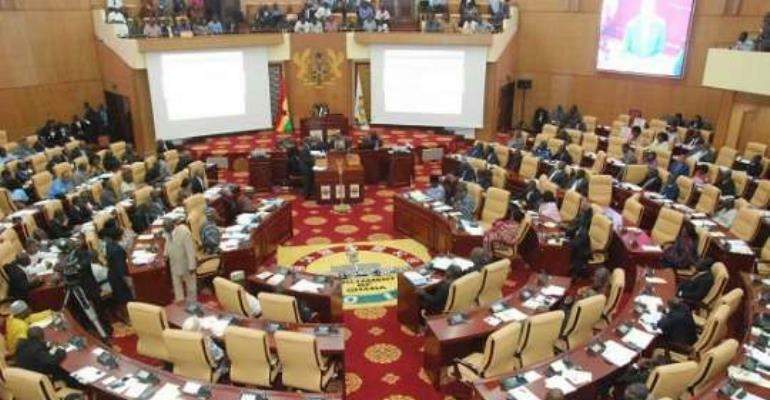 Accra, April 6, GNA – Parliament on Thursday underlined urgent and pragmatic measures for effective check on Cerebral Spinal Meningitis (CSM) that has hit parts of the country. A number of people are reported dead from the disease, which often strikes more in the Northern Belt, usually when the weather is very warm. Two students were reported to have died in Bawku in the Upper East Region, while 11 have been admitted to hospital. The two deceased were second-year science students of the Bawku Senior High School, and the Bawku Senior High Technical School. In Kumasi, the autopsy reports have shown the cause of the ‘mysterious’ deaths of four students at the Kumasi Academy Senior High School at Asokore Mampong in the Ashanti Region has been found to be Meningitis. Students of the school demonstrated against the school authorities demanding to go home following the deaths and almost clashed with police officers maintaining law order. It is estimated that 62 people have died in parts of northern Ghana when the disease, that rages from November to April resurfaced. Dr Mark Kurt Naawane, Member of Parliament (MP) for Nabdam, in a statement on the floor of the House, cited fever, headache and malaria as some of the symptoms. He said the disease was caused by viral, fungal or bacterial infections. He cautioned the public not to gather at densely populated areas as that could generate heat, which attracted the disease. In a contribution, Dr Bernard Okoe Boye, MP for Ledzokuku, a physician, noted that the infectious disease was found in Ghana and other parts of Africa, but early diagnosis was needed to put the illness in check. He said CSM could be cured, but the late arrival of cases at the health institutions had been the cause death. Dr Boye said there was the need to make more vaccines available and make them more available to prevent the disease. Other contributions recognised the need to enhance education on the disease in order to prevent it. What did our governments clamp down in the past and were able to sustain it? Is it illegal logging by loggers? Is it squatters at Sodom and Gomorrah or those around Kwame Nkrumah Circle in Accra? Is it power cheaters who indulge in illegal power connection? Is it cocoa smuggling in our country’s borders by smugglers? Is it vigilante groups who’re constantly terrorising people? Is it the activities of land guards? Or is it middle-men who swindle prospective travelers trying to obtain passports? The irony is that all of them have bounced back—operating vigorously. Their activities seemed emboldened! Inhabitants of Ghana’s biggest slum, Sodom and Gomorrah are back: They’re back to where city authorities evicted them from, less than two years ago. The squatters and hawkers are also back in the streets. The stubborn amongst them all is illegal mining operators also known as ‘Galamsey ‘in Ghana. Their activities in recent times have reached an alarming proportion. No doubt about that, they’ve stepped up their game. This followed the influx of the Chinese. I recall awhile back government deported number Chinese citizens who were in the country illegally. Today, they’re back in their numbers. And together with Ghanaians they’re degrading and destroying our ecosystem. They’re poisoning and exterminating our water bodies. Our vegetation covers have been laid bare—raped and left naked. They’re creating man-holes, producing sinkholes and setting up deathtraps. They’re as dangerous as explosive mines. Over the last 10 years it appears the operators have sworn an oath– basically to launch a deadly onslaught to our very existence. Is this the land of our birth? Is this the land we swore to protect? Is this the land (the greenbelt) our forebears bequeathed us? Where did our leaders go? Where are they? And whether it’s legal or illegal Galamsey has come to stay. That sounds crude or rather rude. But it’s the hard truth. Galamsey isn’t going anywhere at least not for now. Maybe not until the lands have run out of those much-sought-after minerals. Until the gourd is down empty or tanked the drunk knows no stop. Backed by invisible hands they have succeeded in growing not an ordinary roots but giant roots, making it hard for authorities to deal with them. But what is Illegal mining? It can be operated on the surface (open cast) or underground. It’s illegal because in most countries underground mineral resources belong to the state. The latter applies to Ghana too, but Galamsey has trespassed that. I must note there’d been crack downs on illegal mining in the past but all to no avail. Question is: Are we at our wit end? The Minister of Lands and Natural Resources John Peter Amewu announced recently that he’d placed a moratorium on licences for small-scale mining. This is part of activities to halt illegal mining operation in the country. The move, the sector minister also indicated was to help ensure saneness in the environment. ”I have not signed a single small-scale-mining licence, since I assumed office. This is an attempt to sanitise the system,” Mr. Amewu said. Indeed Ghana is fighting an undying witch. We‘ve picked up a fight which portends to be a lifetime battle. You may not like the way I’ve put it but that’s the reality on the ground. I normally don’t say things like that. I am a man full of hope, full of aspiration. I am an optimist and not pessimist. Obviously, the conditions on the ground leaves one to wonder whether our governments had been waging these fights with kid’s gloves or they’d condoned and connived with the operators or they didn’t have long-term strategies or plans to do so. It could be that we’re at our wit end. Remember the father who brought his demon-possessed son (Mark 9:14-29) to Jesus’ disciples to be healed? They’d no idea what to do and how to fight the demon. They lacked the firepower. Bottom-line they couldn’t do it. Jesus rebuked them after healing the boy. I felt I had been wounded twice or three times this past few days. The images I saw—the photos and the videos on social media platforms grieved my heart. I couldn’t understand what’s going on. I struggled to make sense out of all that–the degrading state of our ecosystem is so graphic. It looks so atrocious so horrible and so terrible. The activities of these miners are out of hand. Sad though, we have to come this far to realise that we’re losing or have lost something that is so precious. It’s so sad our leaders couldn’t stop it at its nascent stage. It seems to me it was business as usual and politics at its best. It seems to me they went to sleep whilst the busy bees got busy to degrade, to destroy tad to pillage that which our forebears fought graciously to possess and passed it on. And perhaps what‘s left now is misery and hopelessness. World Bank report on Ghana had indicated, by the end of 1995 the total hectares of the land destroyed through the activities of Galamsey were approximately 150,000 hectares. That was then, over 20 years on the acclivities of illegal mining have picked up like never before .Thus your guess could be my best bet. Between 1994 and 2001 a study discovered that there were five major cyanide spillages and leakages. Five rivers in the Prestea area in the western region of Ghana suffered greatly’. Last March, Minister of Environment Science and Technology Dr. Frimpong Boateng kind of raised the threat level. Whilst meeting staff of the Environment Protection Agency (EPA) during a working a visit in Accra Dr. Boateng hinted that our water bodies were under siege. He said the country risk losing the very existence of these precious water bodies if radical steps are not taken to resuscitate their lives. “We know that our rivers are dead, some of them …Some of the rivers are dead—Offin, Ankobra, Pra, Oda, there’s no fish in them, in most part of the rivers. And when you find animals and fish dying from our empty forests and dead rivers it is only a question of time that it will reach the human beings,” Dr. Boateng said. Certainly the danger has become imminent, so disturbing that if stringent measures are not taken we would end up as sore losers. The country that once boasted of its virgin forests, safe water bodies, rich soils, beautiful vegetation, and the picturesque landscape is gradually losing it all by the day. The ecological damage has been great. In Africa, Ghana is the second largest gold producer contributing to about 5.7 per cent of the country’s GDP. And the activities of illegal mining have tremendously contributed to the growth of the economy. The jobless youth have found jobs, crime rate has gone down. However the environmental impact of their activities is unparalleled. Galamsey depletes environmental resources such as water; soil, landscape, vegetation, the ecosystem among others. Also lives had been lost over the period and we’re still losing lives. In November 2009 a collapsed occurred in an illegal mine in Dompoase in either Ashanti/Western region. At least 18 workers were killed including 13 women who worked as porters for the miners. A similar incident occurred at Kyekyewere near Dunkwa-on-Offin in the Central region. Perhaps the solution to this cancerous problem rests in the bosom of the new administration’s ‘One-District-One-Factory across country mantra. It’s a long term project, but if implemented they would go a long to help bring the activities of illegal mining down. Remember, when there was Aboso Glass Factory, when there was Kumasi Jute Factory there was no Galamsey but there was gold. When there was Nsawam Cannery Factory, the Komenda Sugar Factory there was no Galamsey gold was there. When there was the Bonsa Tyre Factory, the Bolga Meat Factory and the Tomato Factory at Wenchi there was no Galamsey but there was gold. As a people our problem has always been not providing alternative measures. And not being proactive but reactive. You don’t evict the Sodomites and the Gomorrahites if you haven’t made any provisions for them. Then when you provide the alternative, ensure the laws are implemented to the letter. That’s the way to go…Don’t blame me, if you can’t make the dogs bark and bite. 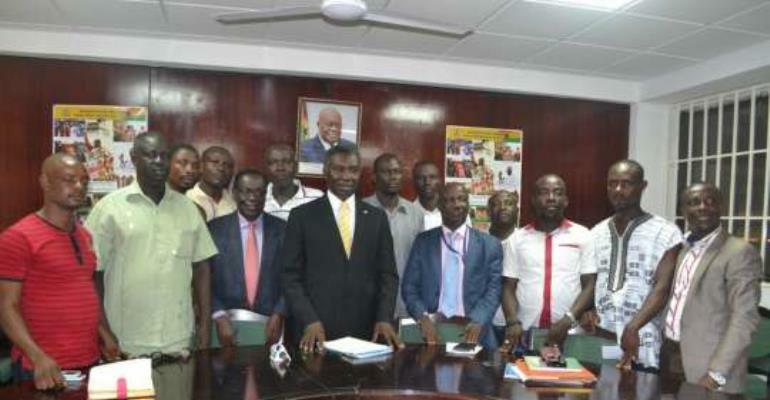 Accra, April 7, GNA – A group of Illegal miners (galamsey operators) from the Western Region have called on Professor Kwabena Frimpong-Boateng, Minister of Environment, Science, Technology and Innovation, to express their readiness to assist government in addressing the menace of galamsey. The group, who were made up of members from Amanfi East, Amanfi West, Amanfi Central and Prestea Huni- Valley districts, mining operators, was led by Nana Ntori Bonkyi Akomea and Nana Asafotse Badu both from Amanfi East District. The Group said they were also concerned about the devastation to water bodies and the forest lands as well as appreciated the public outcry over the situation and therefore supported efforts at finding solutions. Nana Akomea on behalf of the group said they were ready to collaborate with government to regulate activities of small-scale miners and illegal operators and to ensure that they operated within the confines of the law. He said they supported the idea of a moratorium, a period of time where everybody would be made to lay down their mining tools and to be made part of addressing the menace. ‘We are ready to halt all activities of mining in the communities, to allow all stakeholders to come together to repair the damages by covering abandoned pits left uncovered whilst reclaiming the land through afforestation and tree planting,’ he said. Nana Akomea suggested that all those who mined in the rivers and along the river banks should be stopped but those who operated on the land within the confines of the law should be supported and their capacities be built to enable them operate in the right way. ‘We all know that gold cannot be left under the ground, it needs to be mined so we are pleading that we should be helped to do it in the right way,’ he said. Nana Badu on his part called on government to look at the licensing regime in granting mining concession to individuals and organisations and decentralised it at the district levels to ensure that all operators were granted appropriate licenses, and were monitored to see that they operated under the rules of engagements. He said indeed there were about some four million people in the country who benefited from galamsey operations both directly and indirectly, and that it should not be disregarded at all but that they should be assisted to do the right things in the right ways. The group also appealed to government to assist them form taskforces to monitor their colleagues in doing the rights things in the mining sector. Prof Frimpong-Boateng appreciated the efforts by the operators in helping find solutions to the menace, saying, that it was critical to protect and preserve the water bodies and to recover the lands. He said he would send their concerns and appeals to President Nana Addo Dankwa Akufo-Addo to take a decision on the way forward. He said the government would also collaborate with the local communities to recover the lands through tree planting exercises after the land had been recovered. A Sekondi high court has remanded the five Chinese and five Ghanaians who were arrested last Friday by the police in the Western Region for reportedly mining gold in River Ankobra, as their lawyer, Stephen Alawabah, wants them freed. “I want them to be set free because they are human beings. They have rights and I think once they have been here (court) they need someone to defend them in order to be able to prove the case,” he stressed. The Chinese and their Ghanaian counterparts were reportedly seen mining in the river in two communities – Bamiankor and Duwale – last week Friday. The Chinese suspects are Dong Cheng, 30; Hung Jian, 51; Ning Guorui, 42; Yin Biquiang, 46 and Li Zilong, 44. The Ghanaians are Eric Owusu, 28; Kwabena Adjei, 50; Nana Adu, 42; Kwasi Owusu, 28 and Kofi Darko, 21. The police were said to have seized mining equipment from the suspects and were put before court yesterday. Speaking to journalists at the Sekondi magistrate court after brief proceedings, the lawyer for the suspects remarked that the truth of the matter would be uncovered in the course of the trial. Drama unfolded when the ten suspects were initially hauled before a Sekondi magistrate court yesterday. The expectations of the audience and journalists who trooped to the court premises in their numbers were not met as the proceedings did not last long. According to the prosecutor, Sgt Francisca Nyarko, the court did not have the jurisdiction to hear the case, considering the nature of the offence and the punishment assigned to it. She then prayed the court to refer the case to the circuit court in Takoradi. The magistrate, Susana Eduful, then discharged the suspects but they were rearrested and sent to the circuit court for hearing. Immediately the judge made the pronouncement, the journalists and some of the residents who were in the court room quickly moved out and joined available vehicles straight to the Takoradi circuit court. However, to the disappointment of the numerous journalists, they realized that the circuit court did not sit when the suspects were brought to the court premises. The suspects then had to be taken back to Sekondi and this time, to the high court. The suspects were put before a Sekondi high court presided over by Justice Edward Amoako Asante. Their pleas were taken and the court remanded them into police custody to reappear before it on Monday, April 10, 2017. That was after a state prosecutor, George Sackey, had prayed the court to give the prosecution some time to further investigate the case. “We want to find out whether they (suspects) are conducting their mining activities with licence from the relevant authorities and so the police should be given adequate time to investigate,” he told journalists. Counsel for the suspects told the court that his clients were entitled to bail, looking at the offences preferred against them. The court however, refused to grant the alleged galamsey operators the bail and remanded them. 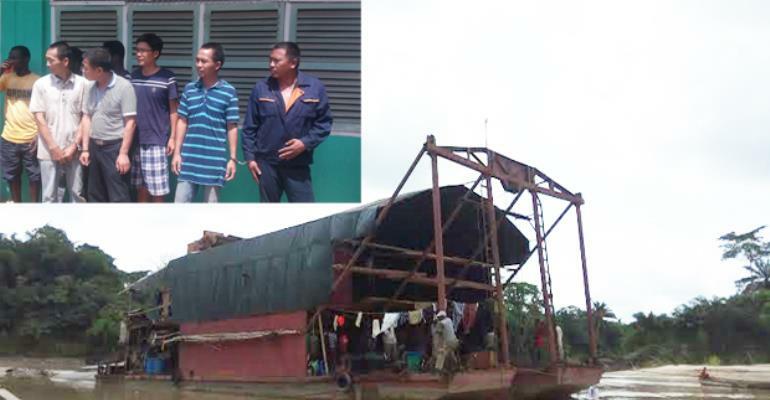 The Chinese were arrested in the well-built ‘water-homes’ on River Ankobra covered with tents and mosquito nettings. They had also built a toilet on the river, surrounded by their mining equipment. Accra, March 28, GNA – Professor Kwabena Frimpong-Boateng, Minister of Environment, Science, Technology and Innovation, has appealed to state authorities, chiefs and individuals to desist from encroaching on public lands to preserve them for their intended purposes. He stated:’This is a very bad thing that I am noticing everywhere, university lands are being encroached upon, CSIR lands in Farrakhan, in the Airport Residential area, in Fomesua, Kwadaso and here at the( Regional Maritime University(RMU) in Nungua, there is so much encroachment. ‘I will beg and appeal to the authorities involved, our chiefs, the Tema Development Corporation and all the municipal authorities just to leave these lands alone because we need them to develop our nation. Our universities need land to expand. Prof. Frimpong-Boateng said these in response to an appeal by authorities of the RMU to the Government to intervene in saving their land, which had been heavily encroached upon. 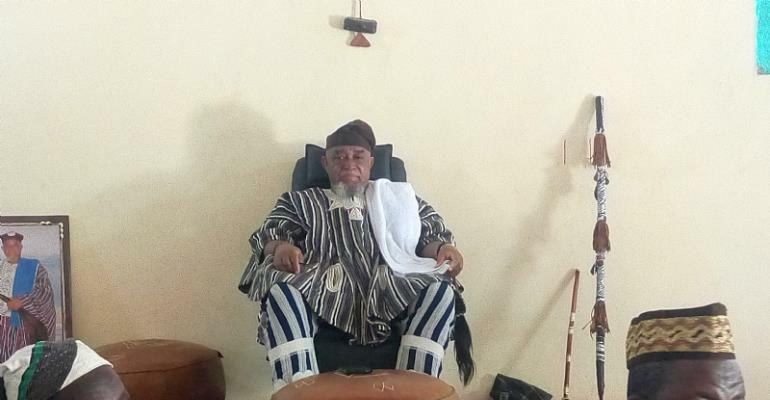 The Vice Chancellor of the RMU, Prof. Elvis Nyarko, who briefed the Minister during a working tour of the University, said most of the institution’s land, had been taken over by encroachers, including a religious organisation. He said the encroachment was impeding the expansion of the facilities of the School, which played a critical role in the maritime industry. He said the Government was very much interested in the School because it was offering STEM programmes. ‘Even though RMU is under Ministry of Transport, we are here because we are promoting the study of Science, Technology and Engineering and Mathematics,’ he explained. ‘As we went around, we could see that this is a technical university that has specialised in Marine Engineering, Mechanical Engineering, Electronics, Refrigeration and Welding, and indeed some Junior High School students can come here and study proper welding so that they can work in merchant ships. He explained that the Government intended to make the teaching of the STEM subjects interesting to children all the way from the primary school to the university level to whip-up and sustain their interest. The RMU’s mandate is to train personnel for the Maritime, Oil and Gas and ancillary industries to acquire knowledge, excellence and discipline in academic, professional, vocational and research work. It also runs the International Maritime Organisation’s mandatory and other short courses and seminars. It currently has 90 per cent of its students as Ghanaians and 10 per cent from the four other partner African countries, with 95 per cent of its staff being Ghanaians.